Gmail is certainly one of those tools we all use. But did you know that many of the most useful features are hidden deep beneath your Gmail Inbox settings? Below is one Gmail tool i'm sure all BDR's and sales pros will find useful. And the best part: it's free! Google labs has some very nifty features we could all use as sales pros. Below is one of my favorites. Canned Responses function very much like reusable email templates that you can use over-and-over again. Rather than pay for an expensive templating software (Tout, Yesware, Salesloft), this functionality allows you to reach out to a larger share of prospects with your more successful response rate templates. 1. 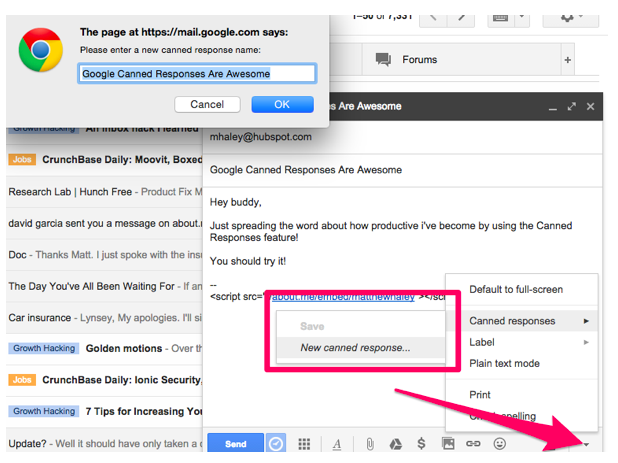 Click the Gear icon in the top-right of your Gmail inbox and select Settings from the dropdown menu. 2. On the Settings page locate the Labs tab. 3. Within the Google Labs tab find the section titled Canned Responses. Then click Enable. 4. Once you've enabled Canned Responses go back to your inbox, compose a new message, and click the black facing down arrow in the bottom right corner of the email box. 5. Once you've clicked the arrow you should now save the canned response and give it a helpful title that will remind you what's in the body of the email. And there you have it! From here on out you'll now be able to compose a new, canned message which you can modify for each new prospect you email!